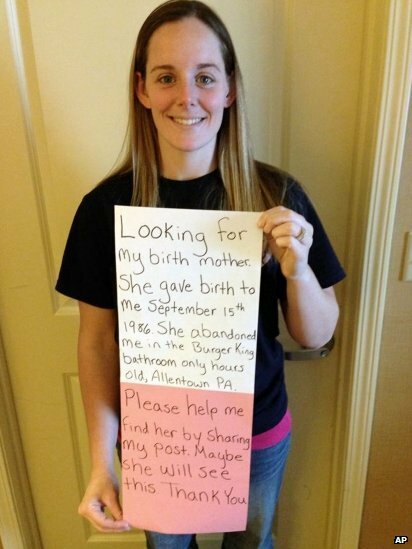 Katheryn Deprill, who was abandoned in 1986 as a newborn in a Burger King restaurant’s bathroom, has found her birth mother after launching a social media search. Katheryn Deprill, 27, began searching for her mother on Facebook on March 2. Her post was shared 30,000 times and caught the attention of her unnamed birth mother, who made contact via a lawyer to arrange a meeting. Katheryn Deprill became known as the Burger King Baby after she was found, just hours old, in Allentown, Pennsylvania. She told media she felt “pure joy” at meeting her mother for the first time on Monday. “She is better than anything I could’ve ever imagined. She is so sweet and amazing. I’m so happy,” Katheryn Deprill told the Associated Press news agency. The unnamed woman’s attorney, John Waldron, said his client had been raped at age 16 while travelling abroad. She allegedly hid her pregnancy from her family and did not take her newborn daughter to the hospital in an effort to avoid answering questions. “It was one of the most emotional, joyful, dramatic, exciting things I’ve ever seen,” John Waldron told the Associated Press of the pair’s initial meeting.